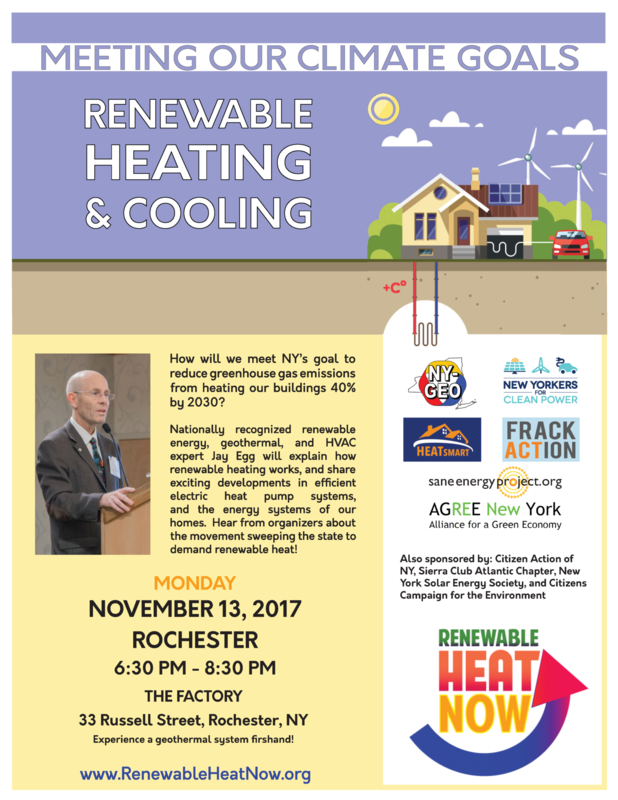 Rochester: Energy expert Jay Egg to give free presentation on renewable-ready systems for heating and cooling – Renewable Heat Now! Rochester, NY— What can we do to meet New York’s greenhouse gas reduction goals of 40% by 2030 when over a third of our emissions come from heating and cooling buildings? Nationally recognized home energy expert Jay Egg will give a free public talk on November 13 at 6:30 at The Factory in Rochester. Egg will explain the efficient electric technologies now available, such as geothermal and air source heat pumps, that allow homeowners to comfortably heat their homes without fossil fuels. The talk, entitled “Meeting Our Climate Goals: Renewable Heating & Cooling” will give insight regarding the options available to home and building owners. The Rochester workshop will be hosted by The Factory, a warehouse in the Neighborhood of the Arts newly renovated into mixed use commercial and residential space. The building is heated and cooled with a geothermal system, and workshop participants will have the opportunity to see the geothermal system in operation. The workshops are part of a series of free public presentations across New York State as part of the Renewable Heat Now campaign. The workshop is sponsored by Alliance for a Green Economy, New Yorkers for Clean Power, NY-GEO, HeatSmart Tompkins, Sane Energy Project, FrackAction, Rochester People’s Climate Coalition, Mothers Out Front, Citizen Action of NY, Sierra Club Atlantic Chapter, Citizens Campaign for the Environment, and the New York Solar Energy Society. Other workshops are happening in Buffalo on November 14 and Syracuse on November 15. These talks are being given in conjunction with a series continuing education credit daytime workshops for HVAC experts, architects and engineers. Visit www.RenewableHeatNow.org for more information. WHY: For home and building owners to learn more about geothermal and air source heat pumps. In New York, most people still use fossil fuels to heat our homes, contributing to 38% of the state’s greenhouse gas emissions. Conversion of 126,000 buildings per year from fossil fuels to efficient electric is needed in order to meet NY’s goal of reducing greenhouse gas emissions 40% by 2030.